What is WinWin used for? Zinstall WinWin transfers all of your stuff from your old computer to your new one: your programs, documents, music, pictures, favorites, emails, accounts, settings - and of course all of your files. Your new computer will feel just like the old one. Your old computer remains safe and unchanged, and nothing is erased from it. If you have a more complicated transfer (such as transferring to an SSD drive), or if the old computer doesn't even run - we can still save your stuff. Use the Migration Kit Pro for that. Zinstall works with Windows 10 (including Windows 10 to Windows 10), Windows 8/8.1, Windows 7, XP and Vista, any edition, 32- and 64-bit. 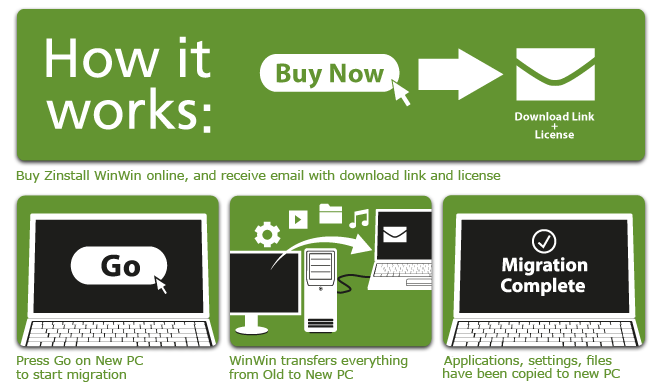 You can transfer from any Windows to any Windows, any PC model to any PC model. XP or Vista to Windows 10, 7 to 10 or even Windows 10 to Windows 10 are all supported. Is it difficult to use? Do I need special cables? You don't have to be a computer guru. The product is completely automatic and intuitive to use (see video above). You don't even need special cables. If you can connect both computers to Internet, then you are all set - nothing else is needed. If not, you can just plug a cable you already have, or go wireless. We'll help you do this. Why is Zinstall better than others? Zinstall is based on unique technology and experience. Unlike other, "file mover"-style products, it transfers the complete environment (although you can of course choose what to transfer), and doesn't harm the old or the new PC. Oh, and if you want to, you can select exactly what gets transferred. Still hesitate? Need help? Our system engineers will accompany you step-by-step and even migrate your PC remotely over the Internet. Contact our Premium Support to schedule your Premium Migration session. Our support team is available 24x7 (by appointment). Rating: 98 out of 100 based on 20 reviews.